The ribosome is an RNA- and protein-based macromolecule having multiple functional domains to facilitate protein synthesis, and it is synthesized through multiple steps. We are studying to reveal the new insights into the function and biosynthesis of the bacterial ribosome. Trans-translation is a novel quality control system in bacteria that rescues the ribosome stalled on truncated mRNA during protein synthesis. This reaction involves a novel protein synthesis mediated by tmRNA, a chimeric RNA of tRNA and mRNA, during which mRNA is switched to a part of tmRNA. We have been studying the molecular mechanism and cellular function of trans-translation since we found tmRNA and trans-translation in the middle of 1990th. We also investigate other ribosome rescue systems mediated by ArfA and YaeJ. 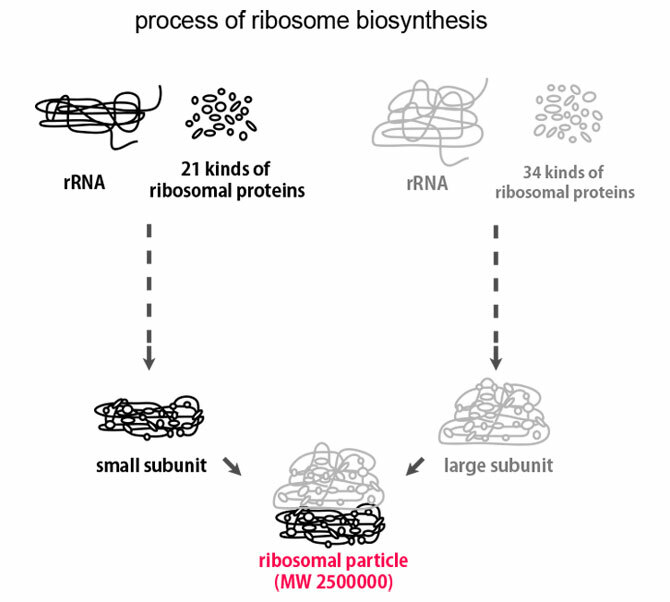 The ribosome is an RNA- and protein-based macromolecule that facilitates a highly sophisticated function, protein synthesis, and it is synthesized through multiple steps including transcription, stepwise cleavages of the primary transcript, modifications of ribosomal proteins and RNAs, and assemblies of ribosomal proteins with rRNAs. This process requires dozens of trans-acting factors including GTP and ATP binding proteins to overcome several energy-consuming steps. We found RsgA, a novel GTPase involved in ribosome maturation as well as its function. We aim to reveal the maturation process of bacterial ribosome through studying the functions of RsgA and other ribosome maturation factors. We showed that defect in ribosome maturation factors or in protein synthesis causes higher osmotic tolerance of bacterial cells. We investigates a new cellular mechanism of stress resistance of bacterial cells. López-Alonso, J., Kaminishi, T., Kikuchi, T., Hirata, Y., Iturrioz, I., Dhimole, N., Schedlbauer, A., Hase, Y., Goto, S., Kurita, D., Muto, A., Zhou, S., Naoe, C., Mills, D., Gil, D., Takemoto, C., Himeno, H., Fucini, P., Connell, S. R., RsgA couples the maturation state of the 30S ribosomal decoding center to activation of its GTPase pocket. Nucleic Acids Res., 45 (2017) 6945-6959. Ma, C., Kurita, D., Li, N., Chen, Y., Himeno, H., Gao, N., Mechanistic insights into the alternative translation termination by ArfA and RF2. Nature, 541 (2017) 550-553. Tarusawa, T., Ito, S., Goto, S., Ushida, C., Muto, A., Himeno, H.: (p)ppGpp-dependent and -independent pathways for salt tolerance in Escherichia coli. J. Biochem., 160 (2016) 19-26. Himeno, H., Tarusawa, T., Ito, S. & Goto, S.: In Frans J. de Bruijn Ed., Defective ribosome maturation or function makes Escherichia coli cells salt-resistant. In Stress and Environmental Regulation of Gene Expression and Adaptation in Bacteria, Wiley/Blackwell, 687-692 (2016). Himeno, H., Nameki, N., Kurita, D., Muto, A. & Abo T.: Ribosome rescue systems in bacteria. Biochimie, 114 (2015) 102-112. Kurita, D., Chadani, Y., Muto, A., Abo, T. & Himeno, H.: ArfA recognizes the lack of mRNA in the mRNA channel after RF2 binding for ribosome rescue. Nucleic Acids Res., 42 (2014) 13339-13352. Kurita, D., Miller, M., Muto, A., Buskirk, A. & Himeno, H.: Rejection of tmRNA• SmpB after GTP hydrolysis by EF-Tu on ribosomes stalled on intact mRNA. RNA, 20 (2014) 1706-1714. 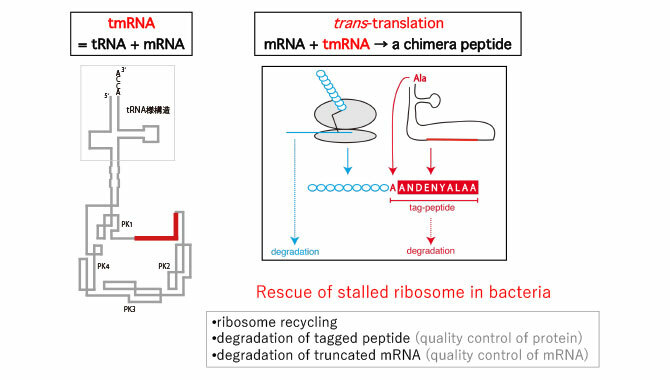 Himeno, H., Kurita, D. & Muto, A.: tmRNA-mediated trans-translation as the major ribosome rescue system in a bacterial cell. Frontiers Genet., 5 (2014) 66. Yang, Z., Guo, Q., Goto, S., Chen, Y., Li, N., Yan, K., Zhang, Y., Muto, A., Deng, H., Himeno, H., Lei, J. & Gao, N.: Structural insights into the assembly of the 30S ribosomal subunit in vivo: functional role of S5 and location of the 17S rRNA precursor sequence. Protein Cell, 5 (2014) 394-407. Himeno, H., Kurita, D. & Muto, A.: Mechanism of trans-translation revealed by in vitro studies. Frontiers Microbiol., 5 (2014) 65. Hase, Y., Tarusawa, T., Muto, A. & Himeno, H.: Impairment of ribosome maturation or function confers salt resistance on Escherichia coli cells. PLoS ONE, 8(5) e65747 (2013). Goto, S., Muto, A. & Himeno, H.: GTPases involved in bacterial ribosome maturation. J. Biochem. 153 (2013) 403-414. Guo, Q., Goto, S., Chen, Y., Feng, B., Xu, Y., Muto, A., Himeno, H., Deng, H., Lei, J. & Gao, N.: Dissecting the in vivo assembly of the 30S ribosomal subunit reveals the role of RimM and general features of the assembly process. Nucleic Acids Res. 41 (2013) 2609-2620. Kurita, D., Muto, A. & Himeno, H.: In vitro trans-translation assay. In Kenneth Keiler Ed., Methods in Molecular Biology, Vol. 905 (Bacterial Regulatory RNA: Methods and Protocols) (2012) 311-325, Humana Press. Himeno, H., Kurita, D. & Muto, A.: Trans-translation by tmRNA and SmpB: a bacterial quality control system of translation. In Kevin V. Urabano Ed., Advances in Genetics Research – Vol. 6, 161-203, (Chapter 3), ISBN 978-1-61209-793-0, Nova Science Publishers Inc. (2011). Kurita, D., Muto, A. & Himeno, H.: tRNA/mRNA mimicry by tmRNA and SmpB in trans-translation. J. Nucleic Acids, 2011 (2011) Article ID 130581, doi:10.4061/2011/130581. Goto, S., Kato, S., Kimura, T., Muto, A. & Himeno, H.: RsgA releases RbfA from 30S ribosomal subunit during a late stage of ribosome biosynthesis. EMBO J. 30 (2011) 104-114.